I was chased out of Southgate station for taking this picture. It’s bemusing how arbitrary the “rules” about photography inside the Underground are implemented. In most locations staff turn a blind eye. In some they even look on with encouragement, especially at the station I’ve earmarked for number 50 (spoilers!). But there have been a few – and only a few – where stern gazes have been topped with stern words, and on one occasion, here at Southgate, stern actions. I was followed back up the escalator and off the premises, my behaviour judged disruptive enough to merit the kind of treatment I’d expect to see meted out to a bottle-wielding stoner than a camera-wielding loner. 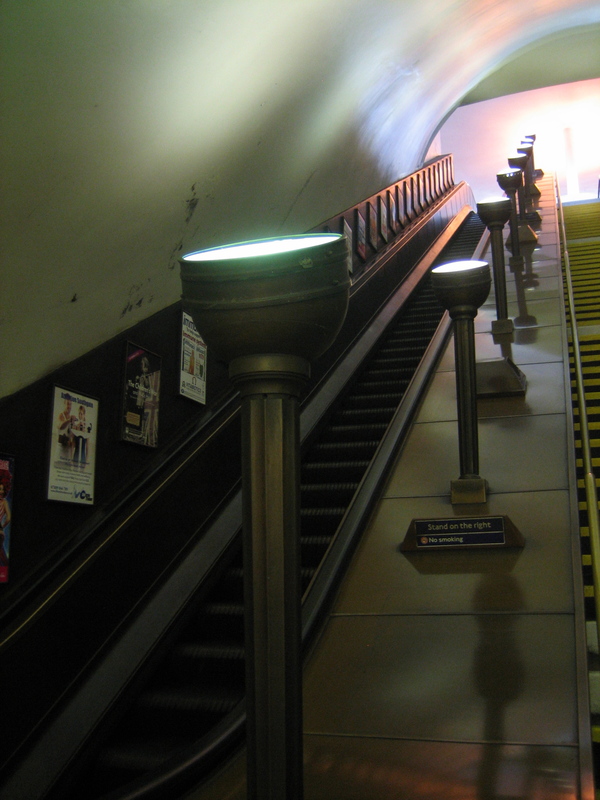 The whole episode rather spoiled my appreciation of the uplighters at Southgate, which only now, several months later, I realise are utterly gorgeous. They are originals – survivors of the inter-war years, stoical and mute, speaking volumes but saying nothing. They radiate history as well as illumination. They inject a dose of the exotic into the otherwise pedestrian business of moving between daylight and the deep. They are also products of the delicious imagination of Charles Holden, the man who dreamed up the station’s brave, eternally-beguiling exterior. An exterior I got to know rather better than the interior. Probably an arrogant jobsworth, of whom LUL has far too many! Ah yes, someone on Twitter just directed me to your project. What a fabulous idea. 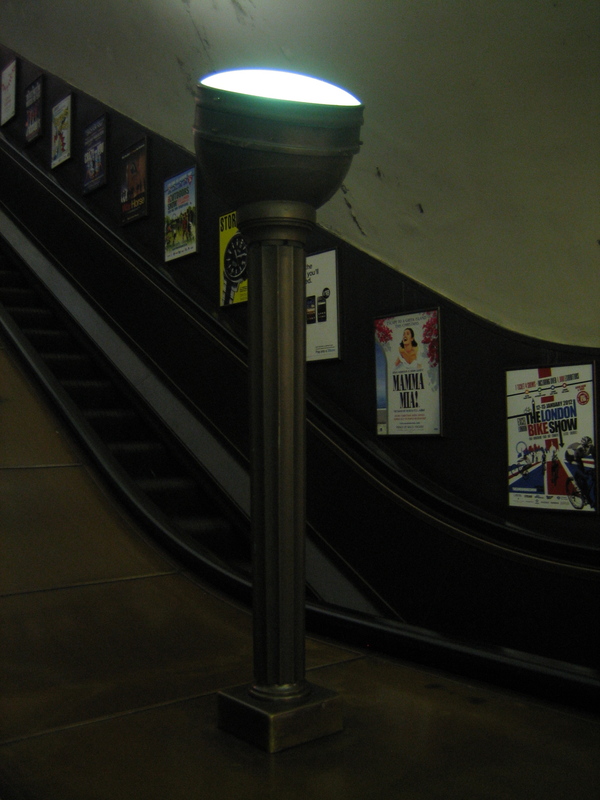 These uplighters also on escalators at St John’s Wood and Swiss Cottage and no doubt others. On the photography thing, last week I needed to shoot a Leslie Green art nouveau lift sign at Regent’s Park ticket hall. There were staff everywhere so I just asked one of them and she said absolutely, go for it. 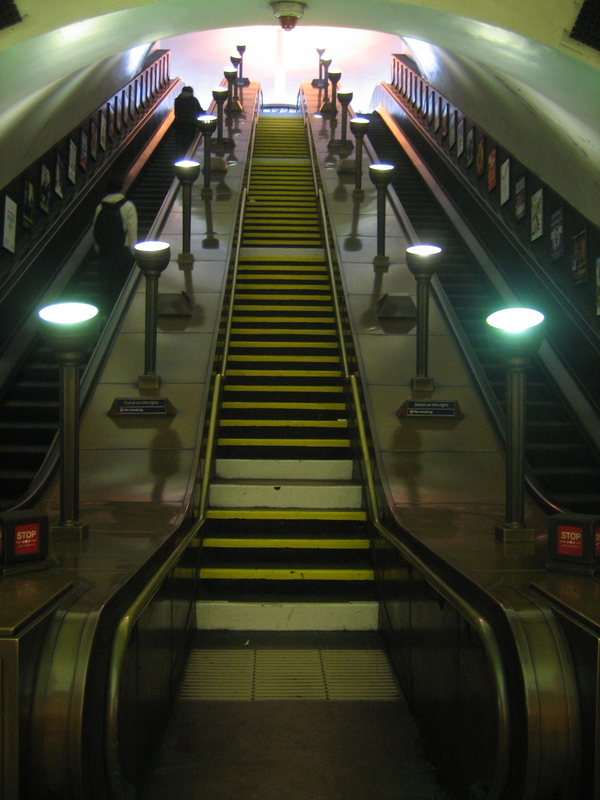 This features in BBC4’s series “Art Deco Icons”, episode 2, which is all about London Transport. Fact I didn’t know before: London Transport has more listed buildings than any other public body in Britain.